Introducing Dr. Bronner’s Toothpaste with 70% organic ingredients! Our low-foaming formula has no synthetic detergent foaming agents, is fluoride-free, vegan and cruelty-free, with no artificial colours, flavours, preservatives, or sweeteners. This product helps to reduce plaque and whiten teeth as the manufacturer advises to brush teeth thoroughly with Dr. Bronner`s toothpaste and floss twice daily. 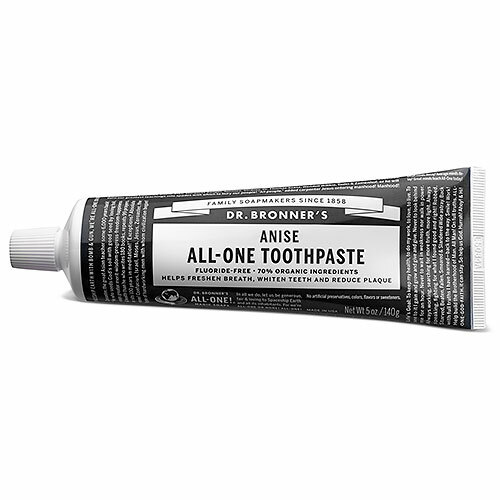 Below are reviews of Dr Bronner`s Anise Toothpaste - 140g by bodykind customers. If you have tried this product we'd love to hear what you think so please leave a review. How to enjoy brushing your teeth. Can really taste the aniseed in this - lovely.